His excellent article about his high-altitude, low-cost (HALO) experimental glider appears in Circuit Cellar’s April issue. 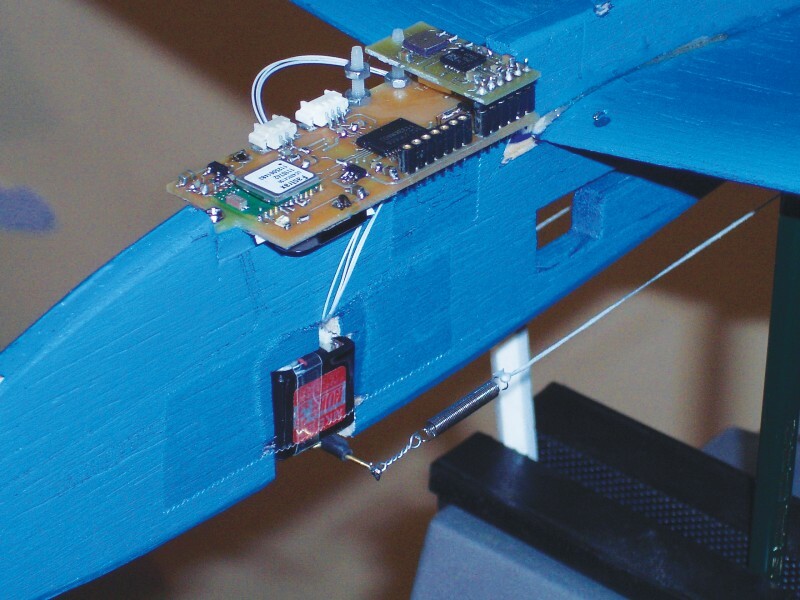 The MCU-based glider includes a micro-GPs receiver and sensors and can climb to a preprogrammed altitude and find its way back home to a given coordinate. Altenburg, a professor at the University of Applied Sciences Bingen in Germany, added more than a few twists to the 80-year-old plan. 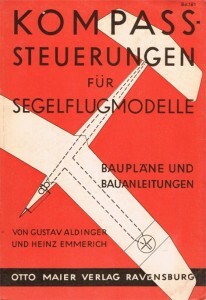 An essential design tool was the Reflex-XTR flight simulation software he used to trim his 3-D glider plan and conduct simulated flights. Figure 1: These are the main components of the Fieseler Fi 103R German V-1 flying bomb. The flight controller was designed as a mechanical computer with a magnetic compass and barometric pressure sensor for input. 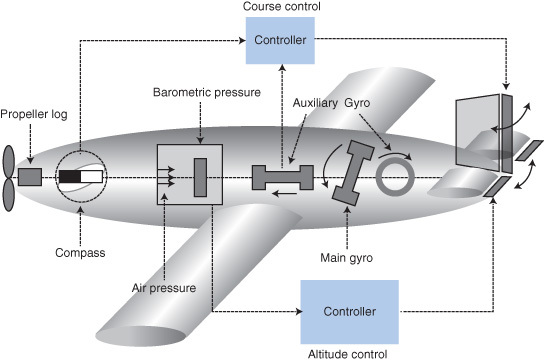 Short-time disturbances were damped with the main gyro (gimbal mounted) and two auxiliary gyros (fixed in one axis). The “mechanical” computer was pneumatically powered. The propeller log on top of the bomb measured the distance to the target. Figure 2: This is the flight controller’s block structure. The main function blocks are GPS, CPU, and power. GPS data is processed as a control signal for the servomotor. Highly sophisticated electronics are always more sensitive to noise, power loss, and so forth. 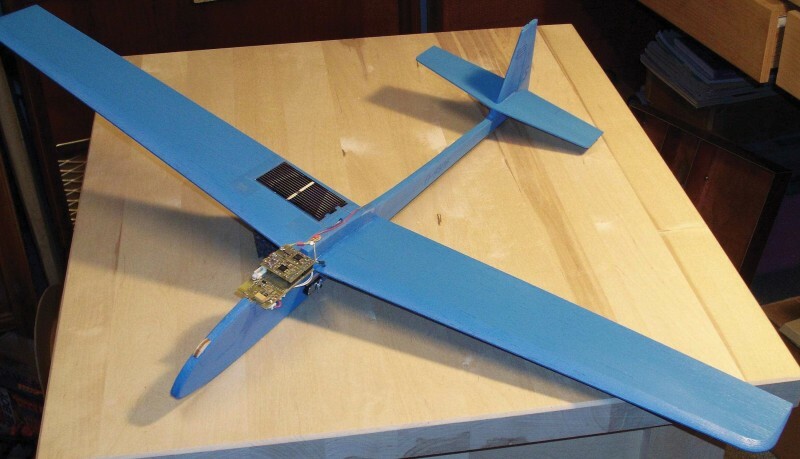 As discussed in the first sections of this article, a glider can be controlled by only a magnetic compass, some coils, and a battery. What else had to be done? I divided the electronic system into different boards. The main board contains only the CPU and the GPS sensor. I thought that would be sufficient for basic functions. The magnetic and pressure sensor can be connected in case of extra missions. The telemetry unit is also a separate PCB. Figure 3 shows the main board. Power is provided by a CR2032 lithium coin-cell battery. Two low-dropout linear regulators support the hardware with 1.8 and 2.7 V. The 1.8-V line is only for the GPS sensor. The second power supply provides the CPU with a stable voltage. 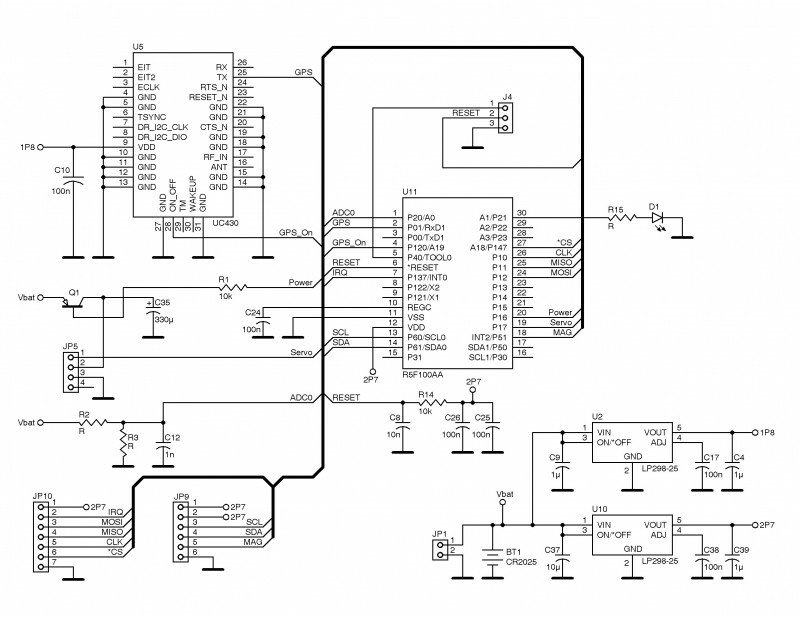 The 2.7 V is the lowest voltage for the CPU’s internal ADC. It is extremely important for the entire system to save power. Consequently, the servomotor has a separate power switch (Q1). As long as rudder movement isn’t necessary, the servomotor is powered off. The servomotor’s gear has enough drag to hold the rudder position without electrical power. The servomotor’s control signal is exactly the same as usually needed. It has a 1.1-to-2.1-ms pulse time range with about a 20-ms period. Two connectors (JP9 and JP10) are available for the extension boards (compass and telemetry).. I used an STMicroelectronics LSM303DLM, which is a sensor module with a three-axis magnetometer and three-axis accelerometer. The sensor is connected by an I2C bus. The Bosch Sensortec BMP085 pressure sensor uses the same bus. For telemetry, I applied an AXSEM AX5043 IC, which is a complete, narrow-band transceiver for multiple standards. The IC has an excellent link budget, which is the difference between output power in Transmit mode and input sensitivity in Receive mode. The higher the budget, the longer the transmission distance. The AX5043 is also optimized for battery-powered applications. For modest demands, a standard crystal (X1, 16-MHz) is used for clock generation. In case of higher requirements, a temperature-compensated crystal oscillator (TCXO) is recommended. Figure 3: The main board’s hardware with a CPU and a GPS sensor is shown. A CR2032 lithium coin-cell battery supplies the power. Two regulators provide 1.8 and 2.7 V for the GPS and the CPU. The main outputs are the servomotor’s signal and power switch. Altenburg’s article also walks readers through the mathematical calculations needed to provide longitude, latitude, and course data to support navigation and the CPU’s most important sensor— the u-blox Fastrax UC430 GPS. He also discusses his experience using the Renesas Electronics R5F100AA microcontroller to equip the prototype board. (Altenburg’s glider won honorable mention in the 2012 Renesas RL78 Green Energy Challenge, see Photos 2 and 3). The full article is in the April issue, now available for download by members or single-issue purchase. Photo 2: One of the final steps is mounting the servomotor for rudder control. Thin cords connect the servomotor horn and the rudder. Two metal springs balance mechanical tolerances. Photo 3: This is the well-equipped high-altitude low-cost (HALO) experimental glider.